These carpets provide a smooth luxurious surface. Often soft, and do show footprints, vacuum marks, and shading. Often considered a rich or elegant look. Curled or twisted tufts of yarn that create a textured surface that helps to mask footprints and traffic lanes. Suitable for all decors, often considered a more relaxed loop. The loops can be of equal height or multi-level. Multi-level loops can be tufted to form patterns. Flecks of color are often incorporated. A type of textured carpet with highly twisted tufts that curl at the pile surface. Great for minimizing the appearance of foot printing. 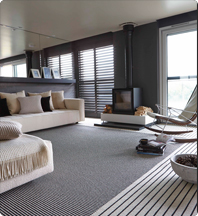 Frieze carpets offer great durability and ease of maintenance. Cut pile construction using either one or two yarn sizes, and often containing flecks of darker colors, creating a casual textured look. Yarns are tufted into large islands of high cut tufts and lower loop tufts to form a sculptured pattern. Usually informal look.